Crab cakes have always been one of my favorite seasonal foods – they’re packed with flavor and their crunchy exterior adds amazing texture to something that was already delicious. Typically crab cakes are fried, but they certainly don’t have to be. In fact, you can make healthy fryer-free crab cakes on the grill, right in your backyard. 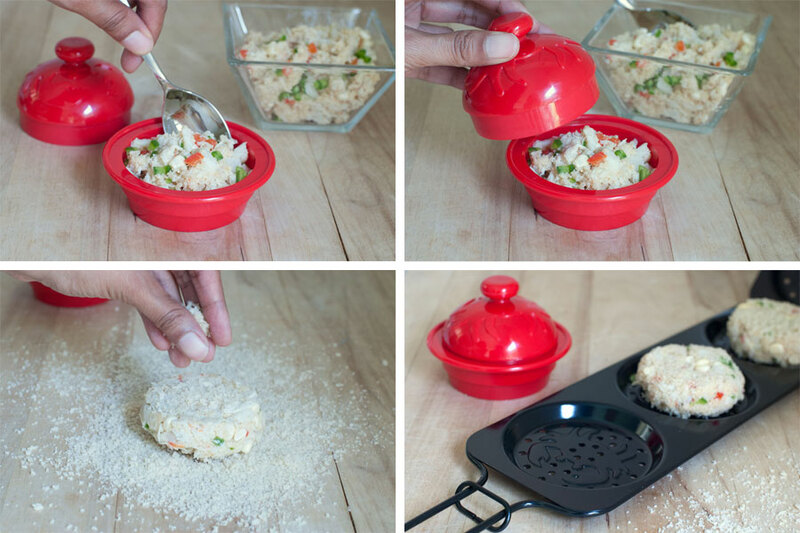 All you need is an inexpensive and handy little tool we like to call the Crab Cake Grill Basket. Normally to get the crunchy, crispy, deliciously toasted exterior on a crab cake, you’d need to make a huge mess in the kitchen. Whether it’s trying to heat up a huge pot of oil, or breaking out that deep fryer you haven’t used since last year, traditional methods for making crab cakes aren’t very convenient or clean. This is where the crab cake basket shines; not only can you eliminate using a fryer (and several liters of cooking oil), but you also make much less of a mess preparing dinner. 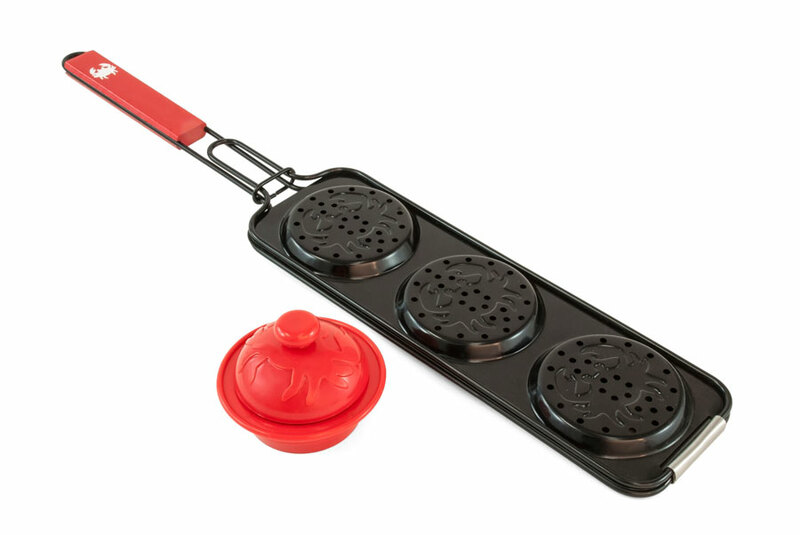 The crab cake basket even comes with a small press, so you can make perfect little patties that fit in the basket’s three indentations. All you need to do to make excellent crab cakes on the grill is to mix up the crab meat and bread the cakes, load them into the basket, and grill them to perfection. 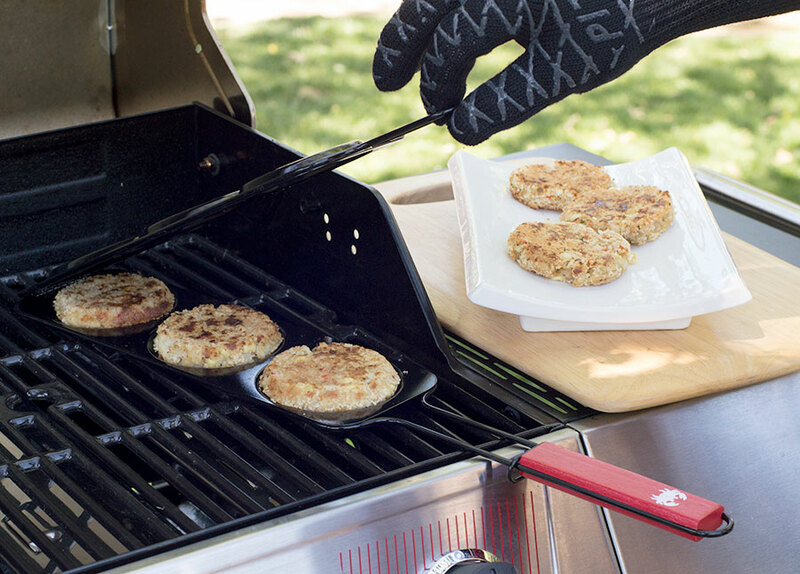 Using the basket on the grill is equally simple; just place it over direct heat and flip as needed until each crab cake is golden brown and warmed through. Check crab meat for any remaining pieces of shell. Place half cup of breadcrumbs into a blender and pulse until fine. In a small bowl, crack and whisk the egg. In a separate medium sized bowl combine mayonnaise, bell peppers, lemon juice, corn, pepper, chili powder, cayenne, and mustard. Mix well. Add the crab, egg, and all of the breadcrumbs to mayo mixture. Mix gently to combine all ingredients. Form the mixture into 6 or 8 patties using the press and place them into the basket. Cook on the grill over medium flame for 5-6 minutes per side until browned.